The two-gigs-in-one-weekend is here. We have some new tunes for you, stand by for the surprises! Friday’s show is a private show for the clients of the Drop In Centre. We are donating our music and reports are it’s a lot of fun. Even though it’s a private show, we can add you to the guest list. If you’ve never been there, this may be your chance. Send us a note using the "Contact" link at the bottom of every page on the website. Saturday’s show is at the Rosedale Hall from 7:00PM to 10:00PM. Tickets from kathymacd@gmail.com. The $30 price includes your meal (at 7:30), one drink, and the music. 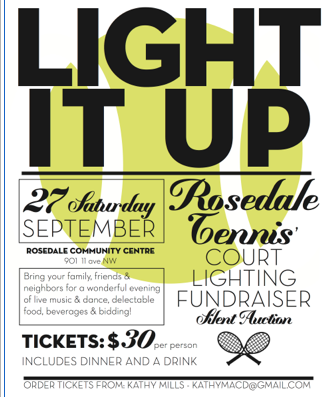 It’s a silent auction fundraiser for the Rosedale Tennis Club, and you will be hard pressed to find a better bunch of guys than the people in the Rosedale Tennis Club. Russ Gauthier from False Flag will be drumming for us at both shows!